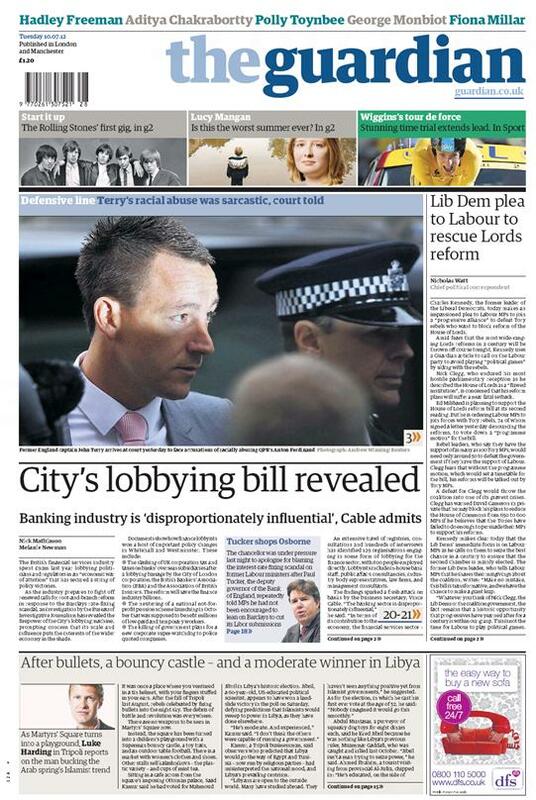 Today’s Guardian front page runs with a headline about how much City firms spend on lobbying, but the main picture has nothing to do with that story. From a distance, you can’t read what story the photo’s about, however, everyone will know instantly what it’s about. Yesterday, England and Chelsea footballer, John Terry, appeared in court to answer charges of a racially aggravated public order offence. The photo, taken by Reuters’ Andrew Winning, brilliantly tells the story. A shaft of light cuts Terry’s face in half, the top drenched in a strong, bright glow, while the bottom half in the dark. The message is clear: If sunlight is the best disinfectant, then it’s only going to partially clean up this mess. Terry, sharply suited, has one eyebrow raised and gives the impression that he is slightly unnerved by his situation. He is, however, staring straight into the strong light. He’s nervous, but he’s not backing down. The police officer in the background completes the image, with flecks of grey hair showing from beneath his cap, he looks senior and sombre. His presence underlines the fact that this is a serious situation.